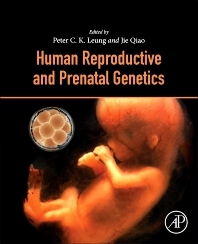 Human Reproductive and Prenatal Genetics presents the latest material from a detailed molecular, cellular and translational perspective. Considering its timeliness and potential international impact, this all-inclusive and authoritative work is ideal for researchers, students, and clinicians worldwide. Currently, there are no comprehensive books covering the field of human reproductive and prenatal genetics. As such, this book aims to be among the largest and most useful references available. Dr. Jie Qiao is the Chief Scientist of the Ministry of Science and Technology of China, the Incumbent Director of the North Third Hospital Department of Obstetrics and Gynecology, the Chinese Medical Association branch chairman for Reproductive Medicine, and the Beijing Medical Association branch chairman for Reproductive Medicine. She has been engaged in reproductive health-related clinical and basic research throughout her career, including as a visiting scholar at the University of Hong Kong and as a post-doctoral researcher at Stanford University. Her research has focused on gametes fertilization, infertility and embryo implantation mechanisms, and polycystic ovary syndrome pathogenesis among other topics. Dr. Jie Qiao has published more than 250 paper publications in peer reviewed journals on topics related to reproductive health.